We had such a perfect day with Kristy and Chris at their Mornington Peninsula wedding at Hotel Sorrento. We met with a relaxed Chris and the boys as they prepared for their day later heading over to Kristy and the girls to capture a few pre wedding photos. Kirsty looked absolutely stunning in her Flora Bridal dress looking every bit the relaxed beach bride. 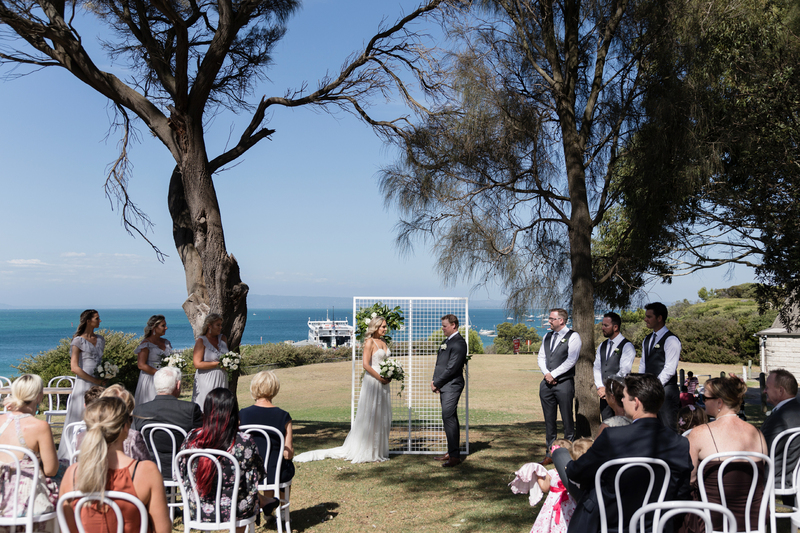 As Chris and Kristy tied the knot in front of family and Friends at Sorrento park, you could not have wished for a more perfect backdrop for the ceremony with the sun shining down shaded by the trees overlooking the bay. After we photographed a few portraits around the park, we then headed to one of our favourite beaches and were so excited to see a pod of dolphins while we were on the pier taking photos! We headed back to Hotel Sorrento where Kristy and Chris joined their guests and celebrated into the night at this wonderful venue. Thank you for having me along to capture your day Kristy and Chris. Shannon.